Tamminen-Peter L. Safe and ergonomic working at home from carer’s perspective. Ergonomics and New Ways of Working the Field of Aged Care at Home. 1. Tamminen-Peter L. Risk Assessment Tools for Manual Handling in the Healthcare Sector. 2. 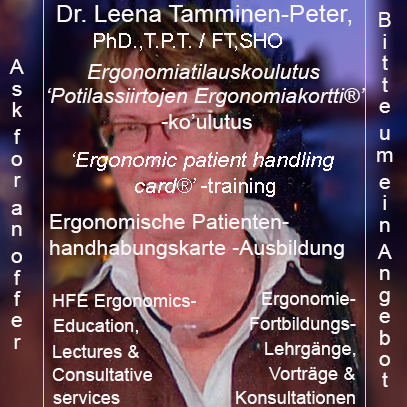 Tamminen-Peter L. & Sormunen E. The Ergonomic patient handling card® -education scheme. 1. Tamminen-Peter L, Nygren K & Moilanen, A. Ergonomic criteria and good practices for bariatric patients’ care. 2. Tamminen-Peter L, Lähdesmäki L. & Tikkanen S. ErgocareBank – Good Ergonomic solutions for both Nursing Home- and Home Care- work. Social partners’ conference on approaches to the issue of musculoskeletal disorders. Paris, France, 24.-25.3.2015. Training as a part of Risk Management of manual handling of Patients in TR ISO/CEN 12296. Current Status and a European Perspective. Healthcare Systems Ergonomics and Patient Safety.